1. Bedsheets – A personal favourite. When I moved in with my boyfriend, suddenly all my single bedding sets were obsolete. I unpicked all the seams, laundered and pressed them. Presto. Free fabric in (sometimes) lovely designs – see old work in progress, left. Some bloggers have taken to purchasing retro character bedding to make dresses from. Check out this awesome Stars Wars dress made from old bedsheets! 2. Curtains – Old curtains are great for making garments that require a little more structure and a heavier weight fabric. Did you see the curtain refashion challenge on the Great British Sewing Bee? Lorna’s skirt was gorgeous and you’d never guess it used to hang in someone’s window. 3. Old garments – Sometimes the answer is right under your nose. Look at your wardrobe. Perhaps that skull motif jersey maxi dress you purchased, that never really suited you, might just be better transformed into something else! What about a pair of leggings? 4. Gumtree/Freecycle/Trash Nothing – There are crafters out there who have a stash problem. I’m still one of them. Sometimes, after squirreling away hordes of fabric, they realise that they just have too much. And might want to part with it. Maybe. Or you could just use these sites to find old bedding, curtains and clothes! Today I found a post for 3x large men’s suits in good condition. This type of find is great for refashioning. 5. Remnant bins – My local market has a fabric/haberdashery stall which has a “bargain bin”. There are always remnants of fabric for about 50p. There are all sorts of patterns, fabric types, colours… This is a great opportunity to grab a fabric you’ve never worked with before. PVC purse anyone? I’ve been lucky enough to find several remnants in the same print, which could easily have been used to create a panelled skirt, or just about anything with princess seams. Anwyay, who’s to say that patchwork trousers won’t be all the rage next year? 6. Charity shops – Somewhat obvious. 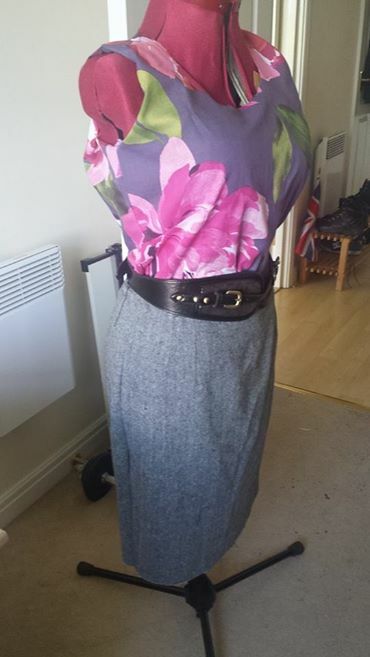 The joys of refashioning a charity shop find have been widely preached by sewing bloggers, TV personalities, and fashion lovers. Grab something that you love the colour or print of, regardless of what it is or how big it is (the bigger, the better to be honest). Take your bargains home and gaze at them lovingly while you figure out how to make those hibiscus print board shorts into a bolero. What has been your best salvage find? Have you grabbed a lucky freebie? Share in the comments below. The answer is yes!! We think alike! My most recent find is a funky tablecloth. I will post a picture in the next couple of days. I’m looking forward to making a top from it (or trying, it’s round). This post is helpful, I learned something new, thanks!